Alongside the 2018 iPhone models, Apple is also expected to launch the Apple Watch Series 4 on September 12 at the Steve Jobs Theatre. The smartwatch is now said to come with a larger edge-to-edge display and thin bezels, apart from new watch faces. Recently, a circular dial design was also leaked, along with a few key specifications as well. Now, 9to5Mac has dug a little deep into the latest watchOS beta to find the resolution of the upcoming Apple Watch, and estimate how much of an upgrade it gets in that department, and the additional screen space. 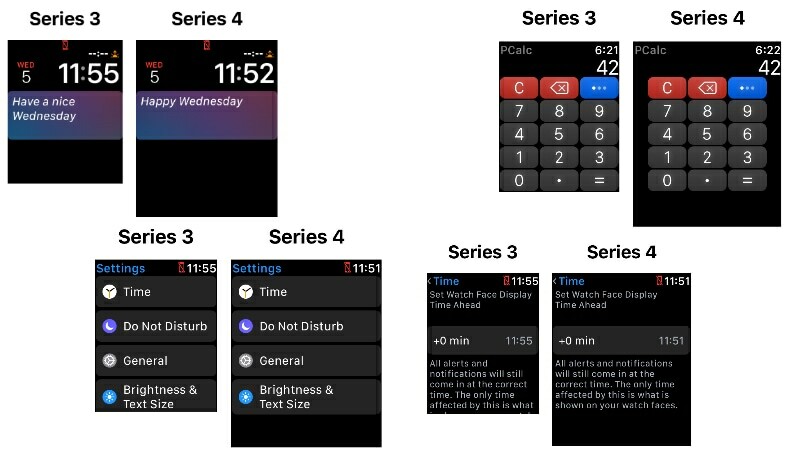 Furthermore, the publication has shared images of how different apps and watch faces will look on the Apple Watch Series 4, compared to how it currently looks on the Apple Watch Series 3. The 42mm Apple Watch Series 4 is tipped to sport a resolution of 384x480 pixels, a significant increase from 312x390 pixels from previous 42mm Apple Watch models, including last year's Series 3, reports 9to5Mac. This hints at a larger edge-to-edge display as a result of thinning of bezels around the display. Upon testing a modified Apple Watch Simulator on the latest Xcode beta, 9to5Mac guesses a PPI of 345. The report states that Apple is going to introduce a significantly larger bezel on the upcoming Apple Watch, and will have new watch faces specifically designed for the new screen. More screen space also means more room for new complications for Apple's built-in apps as well as third party apps as well. No resolution changes for the 38mm Apple Watch Series 4 variant were tipped - the previous models had a resolution of 272x340 pixels. The new large screen means third-party app makers will have to do some tinkering to get their apps structured right on to the new display. The publication did do some testing of how apps look on the new expected large display, as compared to the current generation Apple Watch Series 3 display screen, and has shared comparison images as well. You can see them below. To recall, even analyst Ming-Chi Kuo had earlier reported that the Apple Watch Series 4 will come with 15 percent larger display options and a longer battery life than its predecessor. It didn't reveal whether the size of the overall chassis will grow to fit the larger displays or there will be thinner bezels to make room for the more screen area. All of these speculations will be put to rest at the event next week, and we will give the entire low down in full detail. Stay tuned.